The year 1888 was busy in the annals of crime. 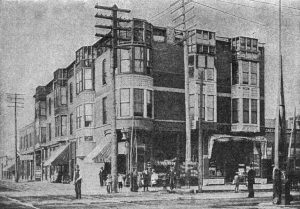 While Jack the Ripper preyed on prostitutes in London, H. H. Holmes oversaw the construction of a large hotel/office building designed with unique amenities. It included hidden rooms, doors literally going nowhere, an airtight vault, and a chute going all the way to a basement crematorium. 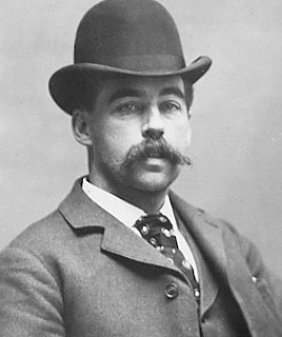 By the time of his execution in 1896, H. H. Holmes, Chicago serial killer at the time of the 1893 World’s Fair, had reportedly murdered more than twenty people. 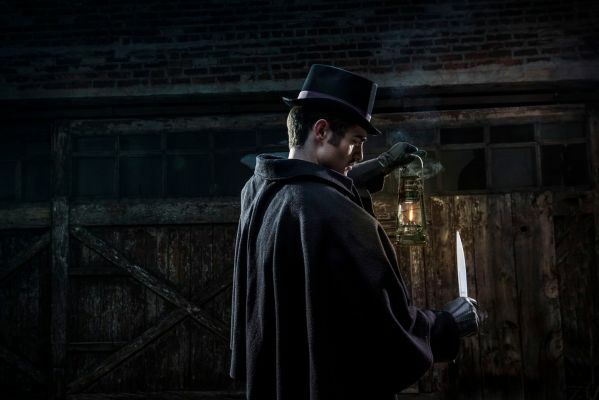 The History Channel series American Ripper gives us the H. H. Holmes treatment but with a twist. The premise is that H. H. Holmes was also Jack the Ripper. Jeff Mudgett, Holmes’s great-great grandson is determined to prove his ancestor was the notorious Jack and partners with Amaryllis Fox, a former CIA operative, to hunt down the proof. First, the positive. This production is top notch when it comes to filming, interviews, aerial drone footage, clever graphics, and historical recreations with a whole cast of folks in period clothes. Amaryllis and Jeff offer nice chemistry as an investigative duo, reminiscent of Fox and Scully in The X-Files. He’s out on a limb, a bit wild eyed at times, and too eager to believe almost anything about his great-great grandfather, no matter how fantastic. She’s there to keep him grounded in cold, hard facts. And she succeeds. Mostly. The History Channel certainly spent some dough to ferry Jeff and Amaryllis across the globe—from Chicago to London and then to New Hampshire, Indiana, and other locations to hunt down related artifacts. They are aplenty, and their history is fascinating. I was definitely caught up in the fact-finding ride and the strategic pacing. Each episode, of course, ends with a clever dramatic hook to keep viewers coming back for more. The series was enjoyable and captivating to watch but with one definite caveat. Make sure your kids are playing video games in another room if you watch this series. Folks in period clothes offer viewers a feel for the alleys of London during the Ripper era and the streets of Chicago when H. H. Holmes was luring single females to his “Murder Castle.” The concept works and offers more human interest beyond so much talk of DNA and handwriting analysis, but the show’s creators chose to emphasize the more gruesome aspects of the Ripper slayings in visual snippets that can only be called gratuitous. A man donning the persona of Jack the Ripper repeatedly slashes into victims with a long knife. Blood drips everywhere. Even internal organs are front and center for the camera. Nauseating visuals, for certain. And who can count how many times the show loops through them? The actual Ripper crime scene photos are disturbing enough. Granted, the subject matter itself would be disturbing to some viewers, but there’s no need to emphasize the gore. The first episode begins with promise, but the hunt quickly becomes more about speculation than about finding hard evidence. For example, the original site of H. H. Holmes’s “Murder Castle” (torn down long ago) is now the site of a US post office; however, part of the yard where Holmes’s basement would have been located is exposed. Maybe there are still body parts buried there, Jeff and Amaryllis wonder. (Really?) They inquire into digging up the yard, but as viewers see repeatedly throughout the series, farfetched investigative leads are often shut down or go nowhere fast. While in London, they want to test a piece of silk shawl linked to one of the Ripper victims. Could there be existing DNA linking the slaying to H. H. Holmes? The DNA says no. H. H. Holmes owned a concrete business along the Chicago River. Where did all his victims go? A dive team explores the river while Jeff and Amaryllis wonder if there could be body parts encased in cement on the river bottom. The quagmire of paperwork and legal hoops to bring material up from the bottom quickly shuts down the inquiry. Handwriting analysis of H. H. Holmes and Jack the Ripper via letters reveals some similarities in penmanship and word choice of the era. But there’s no proof, only conjecture, that one person was the same author. Someone supposedly has an audio recording of H. H. Holmes confessing his murders on a wax cylinder, the cutting-edge technology of the day. But when Jeff and Amaryllis show up, wanting to hear it, the owner says the cylinder is too fragile to play. He hands Jeff a transcript of what is in the recording. Wow, what a letdown. Why doesn’t somebody make a digital recording of what’s on the cylinder before the cylinder decays and can no longer be played? Even if someone is confessing to murder in the recording, there’s no way to know whether the speaker is really H. H. Holmes. Even if the recording is of H. H. Holmes, how does that link him to the Ripper murders? The possible photo of a Ripper victim is found among possessions that may have belonged to H. H. Holmes. There’s no way to prove the items were his or that the woman in the photo is really her. Bones are found in Indiana, where H. H. Holmes murdered a child. Forensic experts determine they are animal bones. Even if they were bones of the child, where is the link to Jack the Ripper? Unfortunately, in spite of fascinating signs along the way, the investigative trail soon turns colder than a glacier in Alaska. Anyone watching with a clear head has to realize by the second or third episode that the engine driving the show is based solely on circumstantial evidence and Jeff Mudgett’s obsession instead of on hard proof. Whenever a new detail emerges, Jeff and Amaryllis exchange raised eyebrows as if to say, We found it, and viewers are left hanging until the next episode. But the evidence never does anything but fuel more speculation or close another door. The show is hopelessly mired in bias. Jeff Mudgett is determined, regardless of the known evidence, that his great-great grandfather was also Jack the Ripper and won’t give up. His monologue at the end of the last episode says as much. I recently heard his interview on the Glenn Beck radio show, and even though the series is over, Jeff is still not satisfied with the final dental evidence. But, in fact, the only hard evidence the show revealed is that his great-great grandfather was indeed buried in a cemetery and didn’t escape his hanging. 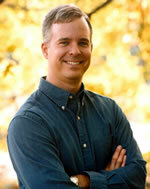 Because of this bias, Jeff doesn’t appear willing to accept any evidence that contradicts his narrative. Solving the case could be easy. If one could establish that H. H. Holmes was in Chicago and not in London during the 1888 Ripper murders, then he couldn’t have been Jack the Ripper. Period. The History Channel investigation of this angle doesn’t appear to be comprehensive enough. Jeff and Amaryllis claim there’s a big gap in Holmes’s Chicago timeline when the Ripper murders were occurring, but they also concede that there’s an avalanche of paper work showing Holmes’s activities in Chicago due to so many lawsuits because of his illegal schemes. Surely there’s something showing Holmes’s activities during that period. Why didn’t they investigate every possible lead of Holmes’s whereabouts in 1888? Adam Selzer, author of H. H. Holmes: The True History of the White City Devil and featured in the series, says he has those leads. For one, Holmes registered to vote that fall; paper work reveals this. Relatives also testified that he visited them in New Hampshire in October 1888. How could he have been in London at the same time? If any of this evidence proves he was active on location in Chicago or New Hampshire that fall, he couldn’t have been in London at that time. It’s impossible. Case closed. Why not more time spent investigating this evidence? Perhaps because the show had a premise to prove and didn’t want to follow evidence that contradicted it. If you can stomach the violent montages, the series investigation is fun to follow, though often farfetched and contrived. I recall some mild language, so keep that in mind. When I reached the conclusion of the final episode, in which the grave of H. H. Holmes is exhumed to determine whether he faked his own death, the feeling I had was similar to that of another History Channel show The Curse of Oak Island. In that show, there’s also a big mystery and an exhaustive search for the truth, but no leads ever take investigators to the treasure. Like Oak Island, American Ripper is fun to watch, and the history is interesting, but ultimately the show is unsatisfying. The show would have been more successful if the goal had been not to prove Jeff’s narrative but to uncover the truth. Then if the evidence pointed to Holmes not being Jack the Ripper, the investigative conclusion would still have been a success. Viewers would have felt like something was accomplished that warranted several hours of watching. To give the History Channel some credit, this show is ultimately about uncovering history, which can be both fascinating and disturbing when it comes to the human heart. If anything, the show can teach us much about the evil in the hearts of people and the importance of never letting anyone like H. H. Holmes claim his next victim. Note: The best book I’ve read about H. H. Holmes is The Devil in the White City by Erik Larson. Some aspects of the true story may be disturbing to some readers, but the hunt to track Holmes down after he goes on the run is especially fascinating.